Why is it important for leaders to be comfortable with complexity in their interactions and their understanding of how the organisation works? "As the world around us becomes more complex, our understanding of how to behave in it is changing fast, fundamentally, and with major consequences for our approaches to addressing present-day problems." explains Aiden Choles (MD of The Narrative Lab). 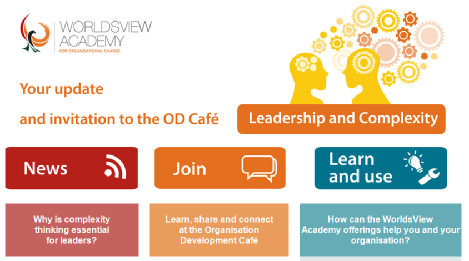 We are proud to have three accomplished and fascinating guest speakers lined up for our Organisation Development (OD) Cafés this quarter. Our first speaker, Aiden Choles, will discuss three broad frames of mind, each of which encompass a set of habits of mind that are critical to leading participative planning and decision making in complex situations.